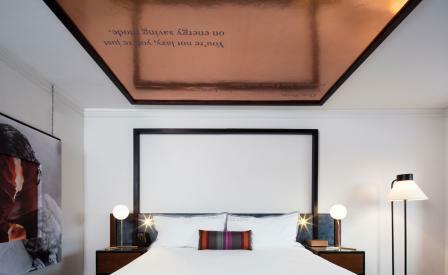 New York-based design firm Stonehill & Taylor - who are behind properties such as the Ace and St. Regis hotels in Manhattan - have transformed the building that previously housed the Ritz Carlton Phoenix into the more design-forward Camby Hotel. Immediately erases any memory of the property’s previous life, the lobby opens up with a bold chandelier, dramatically draped from one of the original coffered ceilings. Beneath that a mix-and-match seating area featuring sculptural copper chairs by Minneapolis design studio Trellage-Ferrill and a teal leather sofa top a Southwest-inspired area rug that channel the region’s rich history. The Camby’s design narrative supposedly references Arizona’s five Cs: cotton, copper, cattle, citrus, and climate, which are known to locals as the state’s major economic pillars. At the hotel, copper is the most obvious: the ceilings in many of the rooms and the light fixtures in the bar and restaurant are eye-catching in their metallic glitz. Elsewhere, leather in various colours and cow-head lamps in the bedrooms are no-fuss nods to cattle. Climate, on the other hand, is realised in subtler visuals like in-room succulents as well as carpets in shades of deep oranges and purples to mimic desert sunsets. Other decorative flourishes (such as the full-wall photo of a shark teddy hanging on a clothes’ pin and the Janus et Cie woven lounge chairs) may not directly relate back to those five points, but their look-at-me allure is totally in keeping with the hotel’s quirky personality.